When I arrived in the once sleepy fishing village of Santa Catalina Panama I knew I was in for a few days of ultimate relaxation. This tiny one-street town and one of Panama’s premier surf destinations is a great stop on the way between Boquete and Panama City. It has also been growing in popularity over the years. And while it’s a one-street-town consisting of one supermarket it doesn’t mean there aren’t a tonne of things to do in Santa Catalina Panama to keep you entertained for a few days. Especially if you’re a surfer. 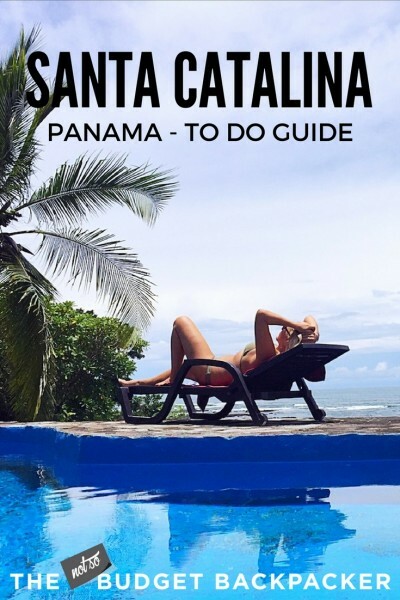 Thinking about making the stop and wondering what to do in Santa Catalina Panama? Well look no further, here are 7 reasons to visit Panama’s secret beach getaway. Surfing is one of the best things to do in Santa Catalina Panama. For me clambering over the rocks nearby was close enough. Being in such a remote area of the world the stars are as bright as bright can be. I spent most evenings staring up and enjoying the stars of the northern hemisphere which are so different to the southern. So if you’re wondering what to do in Santa Catalina Panama. Just look up! 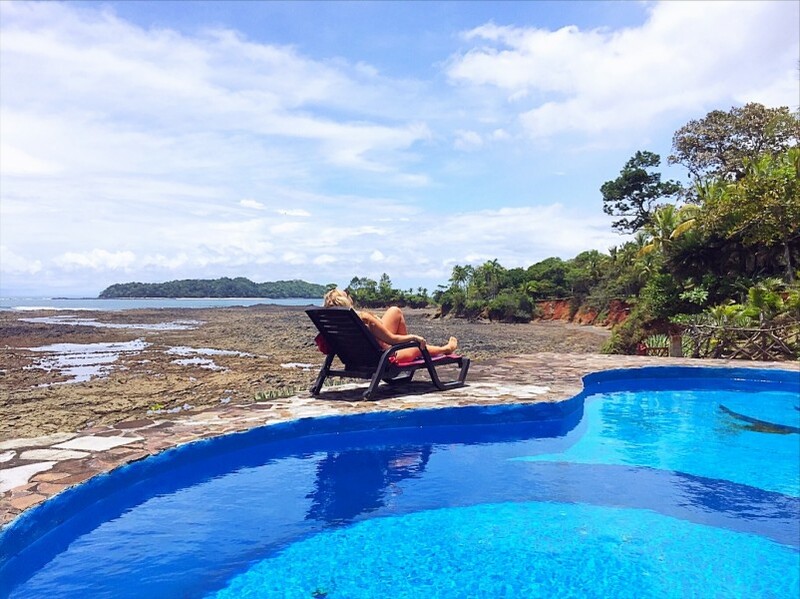 Taking in the views from my Santa Catalina Panama hotel – On The Reef. 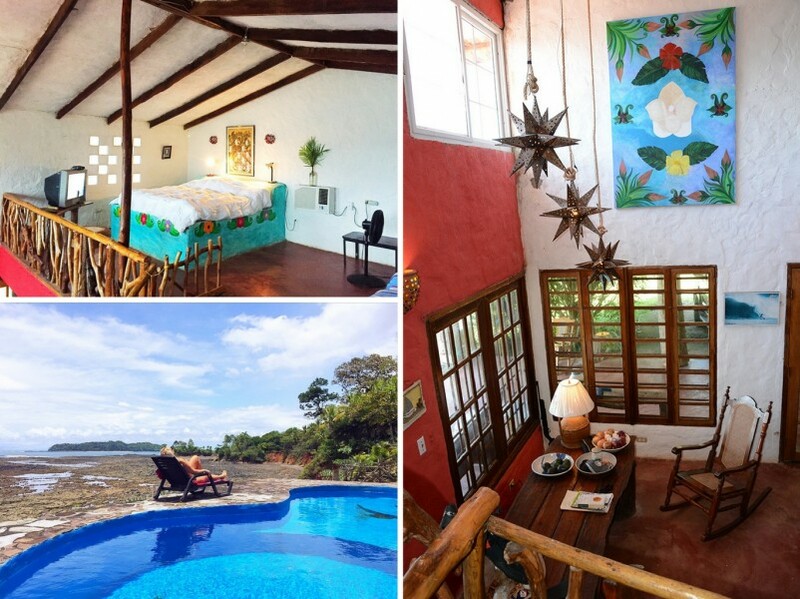 I was lucky enough to be hosted in a beautiful private bungalow at On The Reef Ocean Front Suites one of the best Santa Catalina Panama hotels. And when I arrived and was able to watch the ocean crashing against the cliffs as a big storm rolled in for the afternoon without a soul in sight I knew I was in for some total relaxation. The whole town has little to no WIFI and no ATMs so it’s the perfect place to switch off from the outside world before it’s discovered by the masses. 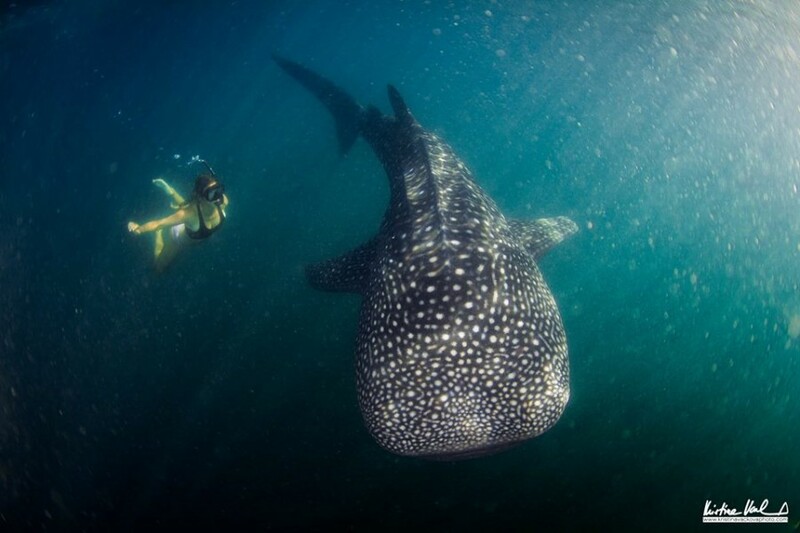 Snorkeling with whale sharks. Incredible! Image credit Scuba Coiba. 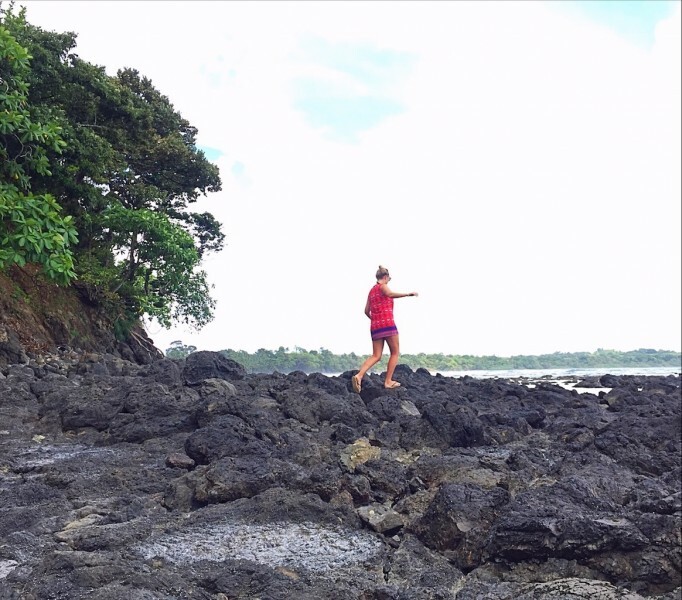 Santa Catalina’s proximity to Isla Coiba is definitely another reason to visit. Isla Coiba has some of the most diverse wildlife in all of Central America. For about $40 one of the local dive shops will take you on a snorkelling tour around the island with the chance of seeing dolphins, whales, manta rays, hammerhead sharks and whale sharks. It’s an extra $20 to actually walk around the island, but it’s not actually necessary as all the best things to see are in the water. A snorkelling or dive trip to Isla Coiba should definitely be on your list of things to do in Santa Catalina Panama. The last thing I expected to find in this little surf town was some excellent nosh. However the Santa Catalina Panama restaurants offer a wide range of options. There are around 25 in the town and they range from Sushi, to Pizza, Argentinian and Panamanian. Some of my faves were the fresh bread at the panadería; Pescao for cocktails; Hibiscus Garden; and La Moncheria Heladeria (that’s Spanish for Ice creamery). 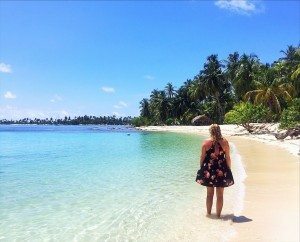 Have you been to Santa Catalina Panama? Let me know your favourite thing to do in the comments. My time at On The Reef Ocean Front Suites was amazing. 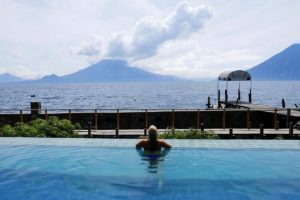 WHERE TO STAY in Santa Catalina Panama: As I’ve mentioned I stayed at on the reef oceanfront suites. and loved every minute. The hotel is a 10-minute walk from the centre of town. And has one of the best views over the main surf break and outer islands. While the facilities are simple and rustic I’d highly recommend renting out the bungalow if you’re a group as you can sleep 5 and it’s like having your own little beach house all to yourself. Did I also mention you have air conditioning, kitchen, satellite TV and own private pool? Can you say luxury? YOU CAN CHECK THE LATEST PRICES AND AVAILABILITY HERE. DAILY BUDGET: The Daily budget in Santa Catalina can really range depending on whether you take a tour to Isla Coiba. However, I’d say it’s possible to survive on $40 – $50 USD per day. how to get to Santa Catalina Panama: Santa Catalina is a 7-hour bus ride from both Panama City and Boquete. The local bus will set you back about $15. There are also direct shuttles for $30 – $35. here’s HOW TO GET FROM PANAMA CITY TO SANTA CATALINA FOR LESS THAN $16 via the local buses. all over the things to do in santa catalina panama and want more of central america?